Come meet us at CES 2019! Wearables are all the rage of 2017! From smart fabric and smart rings to new headphones and fitness trackers, wearables are definitely taking over the tech world. It was hard to narrow it down this month, but congratulations to our winner Octopus, a watch that teaches kids good habits and the concept of time! Read on to learn more about our Wearable of the Month! 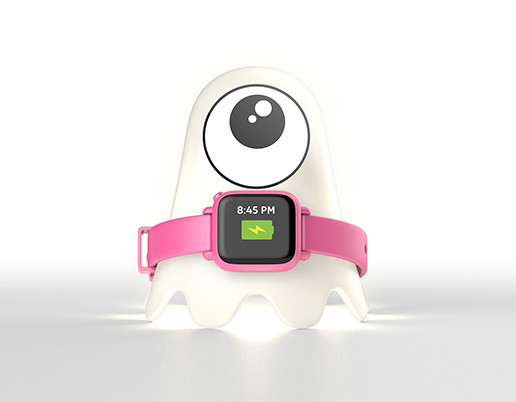 Octopus by Joy is the first icon-based watch that empowers kids by teaching them good habits as well as a concept of time. It’s a watch for children who may not yet be able to understand time, as it shows the time with icons. Octopus is the first clock that young kids can actually read and understand. It also links times to certain events, so that a child can understand when certain things happen. 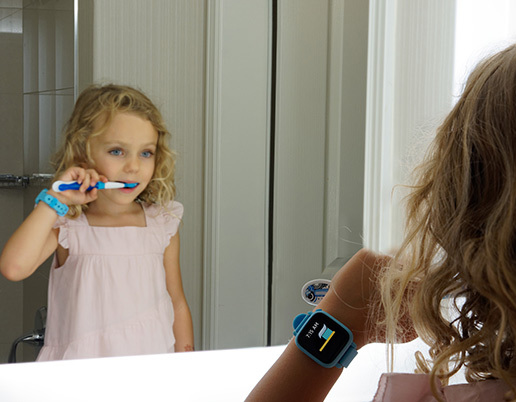 For example, an image of a toothbrush could pop up at 7:30 am, teaching the child that at that time he or she is expected to brush their teeth. This technology can help foster responsibility, independence, and self-esteem, as children are better able to understand and learn their routines and what is expected of them. 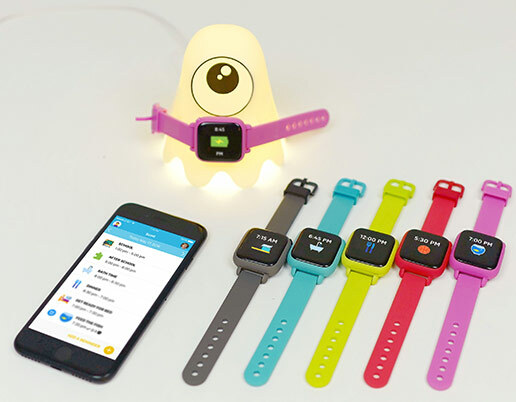 Unlike other products for children on the market that claim to help boost your child’s responsibility, the Octopus is wearable, visual, and it grows with your kids. It’s really the first of its kind, which is exactly how it got its spot as our Wearable of the Month. So what does the Octopus watch do? Well as mentioned above it’s a watch that gives the times in icons so that kids can actually understand what the different times mean. According to Joy, studies have shown that children under the age of 8 don’t understand the concept of time, let alone remember what to do when certain times roll around. They don’t understand that 8 am means it’s time to have breakfast and 8:15 means go outside and wait for the bus. Instead of having their parents remind their children of what to do when, Octopus will help children understand how their parents expect them to use their time. The watch acts as a schedule for children, allowing them to see what they have to do for the day and when they are supposed to do it. 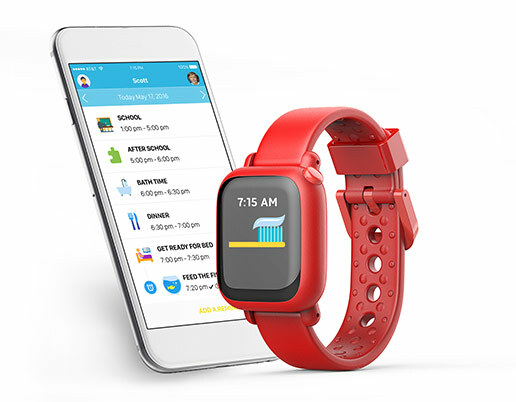 Lastly, the Octopus watch is an assistant for parents, helping them prioritize expectations for their children and allowing parents to program reminders from their smartphones which show up on their child’s watch. Joy claims that the Octopus watch works in three different modes that adapt to the different stages of child development. Basically, Octopus will grow with your child! The first mode helps kids understand time by association. So as mentioned above, the watch displays a big picture icon that is associated with a specific task to accomplish. Parents can schedule these tasks from an app on their phone. In this stage, a child can learn that at certain times, specific tasks need to be completed. The second and third stages of Octopus teach children to read a digital and analog clock. With Octopus, children can learn to form good habits and take responsibility for their actions. Octopus was fully funded on Kickstarter last year and has since been featured on Indiegogo as an In Demand product. You can get an Octopus Watch there for $69, although there are other perks available! With wearables like this watch on the rise, there’s no doubt that soon wireless charging will become an integral part of our lives. Imagine if you purchased an Octopus for your child. Would you rather have your child deal with a mess of cords and wires to charge it, or just drop and charge their watch in one of our convenient charging stations? The answer is pretty obvious, as wireless charging makes tiny wearables easy and convenient to charge! Congrats again to Octopus for being our Wearable of the Month! Read more about our wireless charging for wearables>>! A unique wireless charging solution based on RF resonance and seamlessly integrated into life. How RF Wireless Charging Works? © Copyright 2010-2015 Humavox Ltd. All rights reserved.